The science of cardiovascular mathematics dates at least to the 1700s, when the pioneering Swiss mathematician Leonhard Euler developed a model for fluid dynamics while studying blood flow in arteries. “The love between math and medicine goes back a long time,” says Emory mathematician Alessandro Veneziani. But it was not until the past decade or so, he adds, that advances in computing and diagnostic imaging put fluid dynamics at the cutting edge of medicine. “My dream is that medical simulation will become part of the daily routine of medical doctors,” he says. When it comes to analyzing blood flow problems, you can't beat math. Photo by Carol Clark. His research has helped improve the odds for babies with a heart defect known as left-ventricle hypoplasia. Through computer simulation, surgeons can now predict the optimal size and placement of the artificial aorta needed to keep a newborn alive while awaiting a heart transplant. A recent grant from the Brain Aneurysm Foundation is supporting Veneziani’s research into the tears in neural blood vessels that create balloon-like bulges. Using complex equations to predict the likelihood of rupture in aneurysms could help doctors determine whether to operate, or forego the risky surgery and simply monitor the patient. 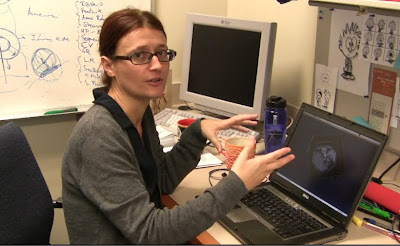 Emory bioengineer Marina Piccinelli develops software to turn medical images into geometric models. The mathematical engineers in Veneziani’s lab work closely with physicians in the Emory School of Medicine and other institutions to develop the cardiovascular models. Some of the problems they are working on include bicuspid aortic valve defects in newborns, atherosclerosis and ventricular dissynchrony. The process begins with differential equations to describe the blood dynamics. Medical images from individual patients are then pixelated into geometric representations. Finally, computer software is used to simulate the flood flow, and all of the data is merged. The image processing software used in the process, the Vascular Modeling ToolKit (VMTK), was developed by the M. Negri Institute in Bergamo, Italy, and Emory. The simulation software, LifeV, was developed by the EPFL (the Ecole Polytechnique Federale of Lausanne, Switzerland), the Politecnico di Milano in Italy and Emory. Both VMTK and LifeV are open-source, available free for download from the Internet. “We want other researchers to use the software to solve blood flow problems, and to give us feedback, so we can keep refining and improving the code,” Veneziani says. Is TRON's 'futuristic' world outdated?